Even after months of planning things didn’t go exactly to plan, which is why it is important to be flexible in your schedule, try to allocate few hours (per day) or even an extra free day to cover missed destination/activity. Our first 3 days in Seoul was ruined by 2 days of rain, thus our schedule was pushed back to the last 2 days of our trip, luckily those days I planned for free and easy excursions. For the coming blog posts concerning South Korea trip, I will highlight the essentials, straight to the point and will be linking to several sites that have covered certain topics such as how to purchase KTX tickets, etc. 1. Flight ticket booking – I used Skyscanner app to search for the cheapest flight. Do note budget airlines will always be displayed as the cheapest but Skyscanner does not take things such as luggage fee into consideration. So be aware. Do not book through Skyscanner, go to the airline’s official website and book through there. 2. Trip planning – This is crucial, plan out the days of where you want to visit. If your trip is mainly focused in Seoul city then try to plan it by location, such as a day in Dongdaemun, the next day in Hongdae, etc. These are big districts and you can easily spend a full day in each of them. I used Google Map to plot my POIs (Point of Interest) and uses different colors to differentiate the days and locations. 3. Accommodation – Once your flight is booked and destination figured out, next is your accommodation. I’ve booked my stays on AirBnB, I like to stay next/nearby Subways but the cost is slightly higher. You can find cheaper stays if you don’t mind 10-15mins walk. 4. Buy intercity travel in advance – Our trip was Seoul -> Busan -> Jeonju -> Seoul, I bought KTX tickets (Seoul to Busan, and Jeonju to Seoul) in advance from KoRail website. Transportation is well connected, you can travel by bus, train or airplanes, depending on your destination. 5. Write down places of interests in Korean – Important! 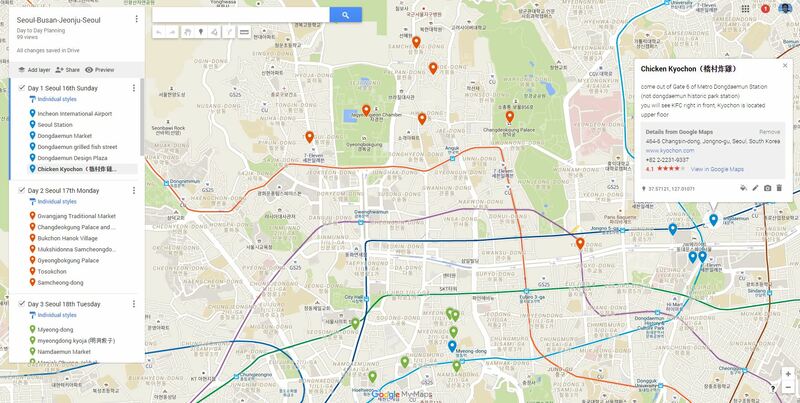 Google map DOES NOT WORK in South Korea! Try to write down all addresses in Korean as well as having their contact number if possible. It will come in handy when you’re lost or too tired to use the subway, you can inquire with passerby or use the taxi. Don’t be shy, Koreans are very helpful, just show them the address and they will try their best to guide you, if not then try the next person! 6. Subway app – My most used app is Subway by Malang, the train exit option is a blessing as I can check which exit is closest to my POI. 1. Money Exchange – Do not exchange the bulk of your money at the airport. While I was there the airport exchange for US$1 were $1,093KRW. Heading down to the city I found available exchanges between $1,110KRW to $1,135KRW. 2. SIM card – I opted for data SIM card by KT Olleh, 10 days package with unlimited 4G access for $38,500KRW. For calling I used SkypeOut and uses chat app such as WhatApps, Messenger, LiNE, etc. to stay connected with my family members. Most AirBNB hosts provide portable WiFi and there are plenty of cafes and shopping malls with free WiFi connection. 3. Collecting your KTX tickets and buying T-Money cards – You can collect your reserved KTX tickets at B1 Travel Center as well as purchasing T-Money card (for subways and buses) at the same counter. This is the floor where you can take Airport Express to Seoul Station as well as all-stops train to the city.